Learn about our exciting student-faculty research collaborations. 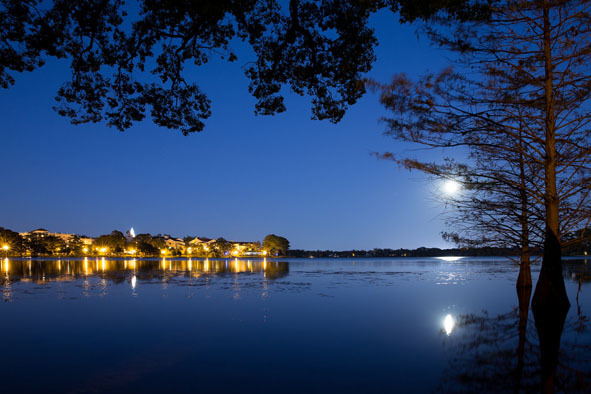 Rollins students regularly present their research findings at national meetings and in peer-reviewed publications. 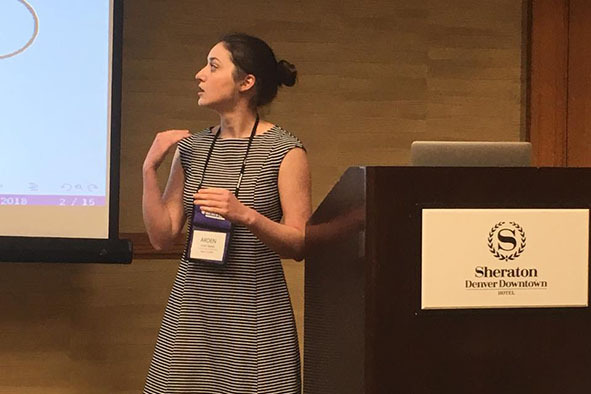 Arden Baxter '18 presented "Modeling Public Opinion" at MathFest in Denver. Our math and computer science faculty are active scholars, engaged at the cutting edge of their fields. They frequently collaborate with students who want to gain in-depth exposure to emerging ideas and prepare for graduate school. There are three primary ways students engage in research. 1. Through the Student-Faculty Collaborative Scholarship program, which provides qualified students with stipends to conduct original research during the summer. 2. As an independent study, where a student receives class credit to work on a research project during a regular semester. 3. As a year-long senior thesis project, typically done as part of the College's Honors Program or as a requirement for receiving Honors in the Math or Computer Science major. Interested in research opportunities? Get in touch with a faculty member. 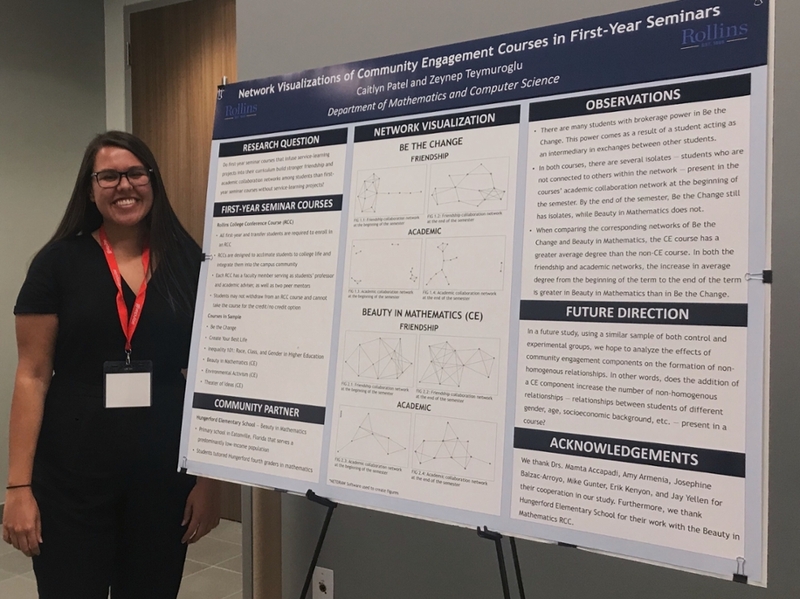 Caitlyn Patel presented her collaborative research results on social network analysis at the Gulf-South Summit, Huntsville, Texas, on April 4, 2019. This summer, Caitlyn will be participating in undergraduate research activities working on Lottery Voting and Sortition at the Grand Valley University, Michigan. The Bass Diffusion Model has been used extensively in marketing to study the spread of innovations. The core assumption is that initial adoption is linearly dependent on the number of previous adopters. Additionally, the model assumes innovative and imitative behavior stay constant and do not change over time. Our research aims to generalize the original Bass Model by including more realistic innovation and imitation processes. Carmen Cheng ('18) and Dr. Dan Myers are using data analytics and machine learning to investigate the key musical characteristics of hit pop songs. This project was supported by the Student-Faculty Collaborative Scholarship program. Dr. Jay Yellen, Dr. Dan Myers, Neeraj Chatlani ('18), Ruzgar Zere ('18), Shree Raj Shrestha ('17), and Jordan Rickman ('14) have developed a new system for course scheduling and have tested it with the Rollins Science and Business divisions. This work led to a presentation at the Practice and Theory of Automated Timetabling conference in Udine, Italy in 2016. Dr. Yellen and Anthony Wehrer ('12) have also published work on course timetabling in the Annals of Operations Research. Neeraj Chatlani ('18) and Dr. Dan Myers have constructed an adaptive system for training new programmers in coding literacy, the ability to read and interpret programs. This work has led to a publication in the Journal of Computing Sciences in Colleges, a poster presentation at ACM SIGCSE, and a grant from the Mindlin Foundation.